Brie Larson is the newest addition the Marvel Cinematic Universe family, and she's quickly becoming used to the studio's rather secretive ways. Larson sat alongside Marvel vets Samuel L. Jackson and Tom Hiddleston to promote their current film Kong: Skull Island. As all three are involved in Marvel films though, you couldn't pass up the opportunity to bring up the possibility of all three working together at some point. Hiddleston will next be seen in this year's Thor: Ragnarok, while Jackson is expected back for Avengers: Infinity War. 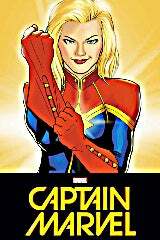 Larson will also be in Infinity War, setting her up for her future solo film Captain Marvel. When asked if they would be uniting at some point, Larson joked "I can't even make a facial expression. I'm scared to even make a face or not make a face, either way, the internet's going to freak out. Don't freak out at me (laughs)." Larson went on to describe how under wraps Marvel manages to keep things, even from members of the cast. "I think people, and I don't know, with my very brief experience, my main experience was at ComicCon with the announcement, and I was backstage in the holding area, chatting" said Larson. "I was out of my mind like "I'm talking to Tilda Swinton, I'm talking to the new Spider-Man, I'm so amazed, and all of them were like "So what movie are you here for? Are you like lost, or are you supposed to be in a different hall?" I was like "Oh no, I'm like part of this now, surprise!" and none of them knew. So I think that says something to like just what's happening behind all of this that it's magical. I feel like I've fallen down this magical hole of mystery that I don't know what's happening." Jackson confirmed those feelings, noting that no one in the cast really knows the full plan. "We know that other people are around, but we don't know if we'll ever encounter them in that universe. Everybody's in different places. While Jackson is fine with that overall, he is a bit miffed he can't just pick up and go to Wakanda. "It's like I can't go to Wakanda for some reason. It's like, really? It's like I'm the only black character you've got in the Marvel universe and all the sudden when you do the black Marvel movie I can't show up in Wakanda? Okay fine, I'll meet them later."